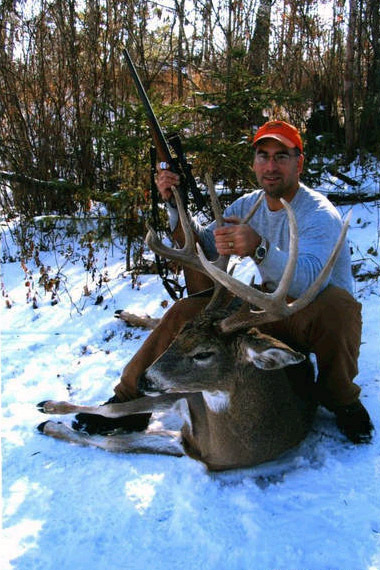 The 2003 deer season is one I'll never forget. It all started with a bitterly cold morning on a tiny portable stand near my home in North-Central Minnesota. I'd been sitting motionless since 5:00 am in -18 degrees; not an easy feat. At about 11:00 am I was fighting the urge to climb down and attempt to warm my frozen toes. I had some heat packs in my duffle which, unfortunately, was down on the ground at the base of my stand. I finally couldn't take it any longer and got down off my stand, even though I knew better. Sure enough, along comes this huge buck! He struts by within 30 yards of me, continues up the hill, and then stops to pose for me just before disappearing over the top. Naturally, my gun is 15 feet above me hanging in the tree! Even though I was tempted several times to climb up quickly and attempt to get a shot, I just froze, getting really good look at those long tines and massive spread. Needless to say I was second-guessing and beating myself up for the next few days. But I stuck with that stand and took comfort in the knowledge that at least I hadn't spooked him, and that as far as I knew he never knew I was there. After many long hours, and just as I was starting to think I'd never see him again, a doe showed up with the big guy in tow. I let him come within 30 yards when he turned broadside and offered me an easy shot for my single-shot .243. After about 20 minutes of nervous tracking ( there was no blood trail despite the fresh snow and a good lung hit), I found him piled up in some brush about 70 yards from where I made the hit. 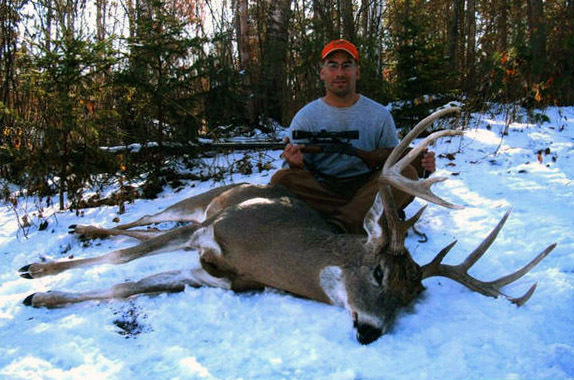 His tall 4x6 rack scored 162 non-typical points, with a maximum spread of 23 inches. He weighed 220 lbs.